We need to install a radiator in our kitchen/dining area because of an condensation issue and that side of the room being very cold! The room already has one radiator. Instead of a radiator, we are considering an electric fire to make more of a cosy, feature area. Something similar to the below. The kitchen is a shaker style, but we will be looking to add a more contemporary one in in the coming years. 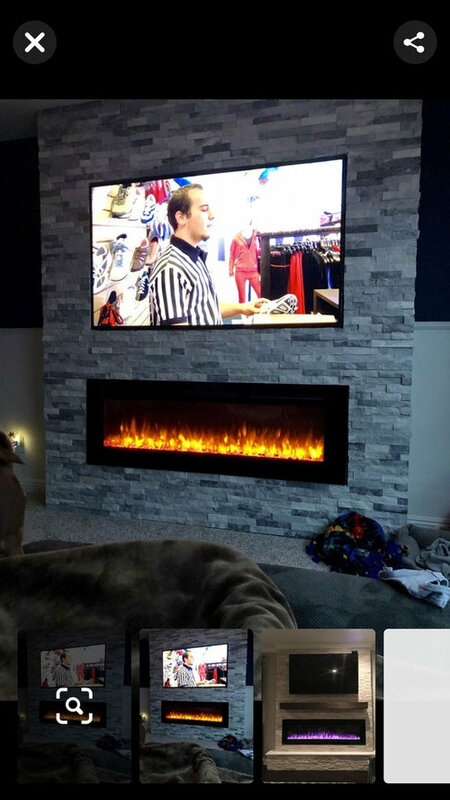 This fire needs to fit in with this style and the rest of the house. The house is an old 1700 farmhouse, and we've been adding a contemporary stamp to it, and trying not to lose its charm. Do you think this would look odd in the space? Are there other options? Please see photos below of the kitchen plus dining area as it is when it was up for sale. I've also included an example of the fireplace style we're thinking of. It would go on the wall with the clock. If it’s a farmhouse would a wood burner suit? It’s certainly a cheaper option than a wood burner to buy and install. Electric fires are more expensive to run than a radiator (or at least that’s what Martin Lewis the money saving expert says! 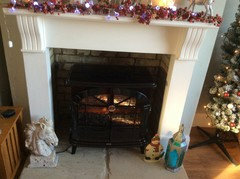 ), but I have an electric faux wood burner in my living room and it certainly is cosy and so easy to use. It isn’t enough to warm a room when it is very cold and icy outside, but fine on our British damp, drizzly days. I can’t have a wood burner as I have allergies and they make me ill. It’s quite a modern design, but if you’re wanting to become more contemporary then go for it. I like it but tbh your kitchen looks like a traditional dedicated kitchen dining space and not sure it seems right? Do these electric versions have a fan? If yes then that adds to the kitchen noise volume too. Seems to me the best thing about these electric fires apart from installation ease is the warm fire “light” relaxing ambience they provide which seems better suited to relaxing rooms with lower light levels? I think the one with the weathered grey cladding would look good, as you are planning to change the kitchen at some point I think this would be a good solution, the inset fireplaces are quite good and most are a similar output to a 2 KW fire. (like you used to get from the council when your heating broke down years ago) lol. 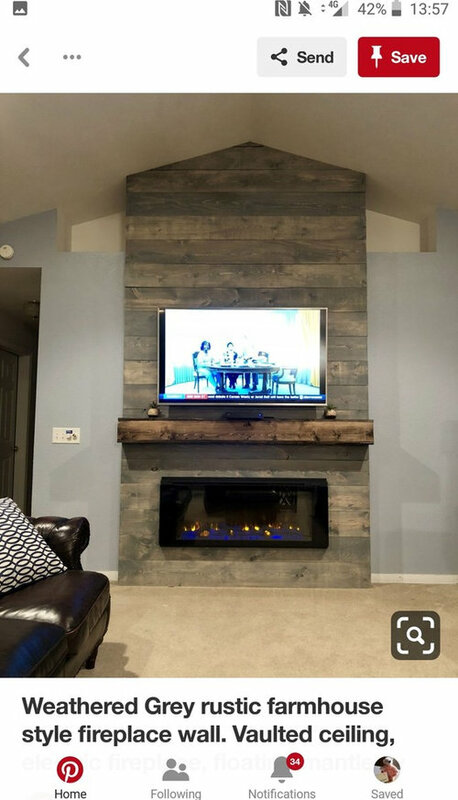 You may be able to get some reclaimed timbers that could be used to give it that extra rustic feel and possibly could be bleached a little if needed. Thank you for all of your comments and time. We had considered a wood burner, however not sure it would get signed off with an extractor in the same room and it also wouldn't provide the instant heat we need. It would look lovely though...! 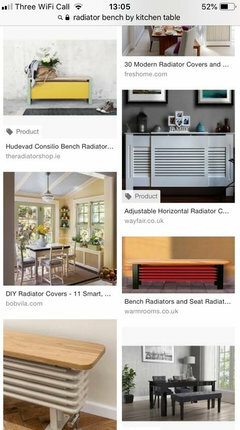 We now are wondering if a radiator is just the way to go. 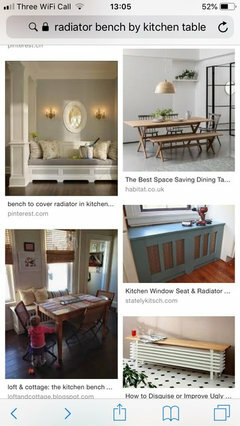 We are concerned that an electric style heater like one in the photos, won't warm the space enough and will just blast the space with heat in front of it rather than warming the whole room and keeping the wall condensation free. Also the space behind the boxed in area won't be able to breathe and will become more damp. Unless anyone has any other solutions (or knows different to the above) I think a radiator will be the way we go. An electric fire isn't enough to heat that room as the only heat source, it would be for aesthetics. I'd go for a radiator if I were you. good luck! 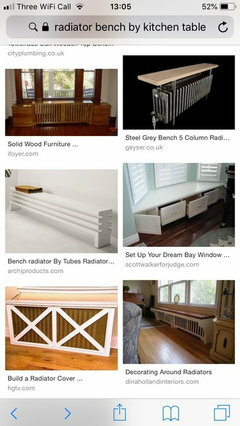 Firstly can you make the existing radiator better?- for instance some newer radiators give out more heat, you could go bigger or make it a double. If it were me I think a wood burner would look more appropriate. You are right about the conflict with the kitchen extractor so you need to speak to a wood burner supplier about the feasibility of having an external air source for the stove. Can you not now get electric fires made to look like wood burners? Think the one above is an actual wood burning stove! Think glen dimplex do some sort of electric fire fake smoke thing. I have an electric fake wood burner thingy. Fools everybody! However I use it more when it’s a bit nippy outside but not freezing cold. I don’t like it too hot indoors, but once the temperature hits 5 degrees or less outside we put the radiators on. The electric fire isn’t enough at these temperatures, think of it more as an addition to radiators, rather than a replacement. Only cost about £150 too! @Beano naughty google, you'd think typing in electric wood burner would bring up just that! I should have checked my link before posting! Thanks to @forzaitalia for confirming such a thing does exist! Thanks again for all your comments. The bio fuel looks great, but probably not safe with a toddler and a bit fiddly if you have to add fuel each time. I think we'll be going with a radiator or possibly a wood burner, increasing the output of the existing radiator may mean that is an option. I've discovered these today, gas wood burners. Are these any good at warming a whole room? Yes most definitely - they give off a tremendous amount of heat and they are super efficient as well as being really realistic to look at without the mess of a real fire. . . We sell a lot of these fires at our Showroom in Coventry. If you'd like to see the range of NEW ExDisplay fires and stoves we have why not take a look at our Facebook Album https://www.facebook.com/media/set/?set=a.2003425699749279&type=1&l=c75abdffe0 or give us a ring on 024 7693 5212 to discuss your needs - we will be only too pleased to give you help and advice.